A perfect blend of highly effective and concentrated. Similar to glycolic acid peels, lactic acid peels are alpha hydroxy acids (AHA), derived from milk. 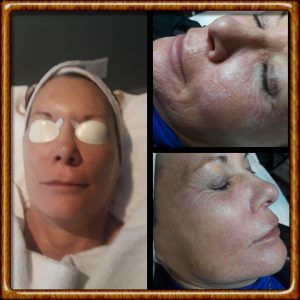 They are very mild chemical peels with little to no downtime. Because lactic acid is a natural human metabolite, there is less chance of an allergic reaction with this type of peel.This product is a good choice for first-time peel users or for those with sensitive skin. However, mature, dry or oil skin types can also use this peel. Salicylic acid was originally extracted from willow bark, and is still found in homeopathic remedies and skincare products.Salicylic acid is a beta hydroxyl acid, which is different from Glycolic acid( an alpha hydroxyl acid). The difference in the chemical structure exists specifically in the position of the hydroxyl group.This peel is excellent for the help of eliminating acne lesions,for it has powerful anti-inflammatory and anti-bacterial properties. INTENSIVE BRIGHTING PEEL THE SUPER PEEL!! This is a great peel for a lightening of sun spots, shrinking large pores, smoothing wrinkles and fine lines. .This is an excellent peel for the elimination of Sun Damage when done in a series, or combined with Microdermabrasion. This peel is formulated from sugar cane and contains the smallest molecular size of all AHA’s. It is great for conditions that relate to topical accumulation of dead cells and bacterias. Acting alone it will help lighten skin pigment and related issues. It also is non invasive but will let you know it is there! This is a uniquely active formula that contains significant concentrations of Pure Retinol Vitamin A (retinol) combined with the resurfacing value of Lactic Acid and Pure Mandelic Acid. This combination allows for deeper exfoliation of surface dead skin cells as well as a powerful decongestive mechanism for the accumulation of lipids and oils surrounding the glands and hair follicles. Vitamin A at this condensed level is known for its ability to stimulate and increase the production of healthy skin cells “the natural production of three building blocks – collagen, fibronectin and hyaluronic acid – thus visibly reducing the signs of aging. These peels are highly effective, however somewhat invasive. There is a peeling process to these peels.Approximate time is determined by the intenstinty level, layers and individual skin type. Also, a pre-conditioning process is a must with these PEELS. The process or amount of time for pre-conditioning will be determined per individual. A consultation is also a must before scheduling these peels. Especially for the elimination of Acne Scarring, Discolorations, Wrinkles and Skins with Significant Solar Damage. These peels come in different strengths and PH’s. The amount of layers per application, and percentage of concentration of peels, will be determined at the time of consultation.